"Gunshot wound, this is a gunshot wound, and this one, there are so many gunshot wounds," said Sri Lankan government vet, Doctor Chandana Jayasinghe. He was standing next to the huge, slumbering bull elephant in a clearing in the jungle, hypodermic syringe in hand. "It is normal, they all have gunshot wounds." The men of the Wildlife Conservation Department had ventured into the tangled scrub to find the wounded elephant. Treading carefully not to snap twigs and prompt a charge, they had moved up close, so near they could see his ears flapping behind the thick greenery, before one man shot him with a tranquiliser dart. Now he lay on his side, slow, heavy breaths rattling in his trunk. They gave him antibiotic injections and sprayed disinfectant on his wounds, some old and calloused, others new and raw. The renewed civil war between Sri Lanka's government and the separatist Tamil Tigers is claiming many victims, among them increasing numbers of the island's wild elephants. Of the 74 elephants which died in the north and north-west region last year, 44 were killed by gunfire. The others fell victim to poison, were deliberately electrocuted by farmers who connected wire fences to the mains, or fell down wells. Just four died of natural causes. 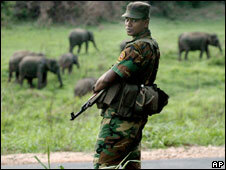 The elephants are not straying into the frontlines. Wildlife officials say the shootings are in part an unintended consequence of a government initiative to deploy thousands of new home guards to villages near the frontlines and to arm local people. "Due to present security conditions people are armed by the government to protect themselves from the Tamil Tigers," says Manjula Amararathne from the Wildlife Conservation Department. "But in some areas people use such weapons to kill elephants also." 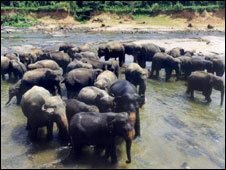 There are as many as 4,000 wild elephants in Sri Lanka and many live in uncomfortably close proximity to man. Farms are being carved out of what was once jungle and the remaining forest patches are getting smaller. As dusk falls, local farmers set out to patrol their fields, peering into the gloom and starting at shadows. They set off crackers to try to frighten away foraging herds. It is not just crops that are damaged by the elephants, houses are frequently knocked down, and people are killed too. 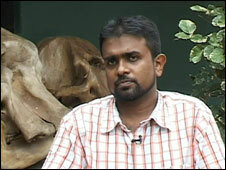 "They didn't see the elephant until they came near it," said Asanga Reno, standing by the freshly dug grave of his mother Ranjini. "They were afraid of the elephant and the elephant panicked too." Asanga Reno has been given compassionate leave from Sri Lanka's navy to come back to bury his mother. As is traditional in Sri Lanka the last yards to the grave were fenced off with white streamers that blew in the hot breeze. The elephant pulled Ranjini off the back of the motorbike on which she was travelling home from the fields, and threw her down by the side of the road. By the time her husband got there she was dead. The Wildlife Conservation Department is trying to keep man and elephants apart. They are erecting low-voltage electric fences around villages. Plants palatable to elephants are being cultivated in the remaining jungle patches so the animals are less tempted to go and forage elsewhere. And new recruits to the home guards are being given special training - they are being taught to shoo away the animals rather than turning their guns on them. "We train them to avoid them and not to harm them, how to protect them and by doing that, how to love fauna and flora," said Major Priyantha Rathnapriya, who is in charge of the Galakiriyagama training camp. "Definitely, we don't shoot any more. We don't do that." Back in the jungle the bull elephant was being encouraged to show signs of waking up after his treatment. One of the team from the Wildlife Conservation Department was poking it gently with a stick and shouting: "Come on, elephant. Get up my son." The elephant will survive his wounds, which had been cleaned. But thick as the jungle was where he was lying, fields and houses were just a few hundred metres away. There is a high chance he could be shot again, another casualty of the conflict between man and elephants. "Actually this is the main problem, I think the elephants should be in the jungle," said the grieving Asanga Reno at his mother's graveside. "We can't do anything. The elephant won't live in the jungle."